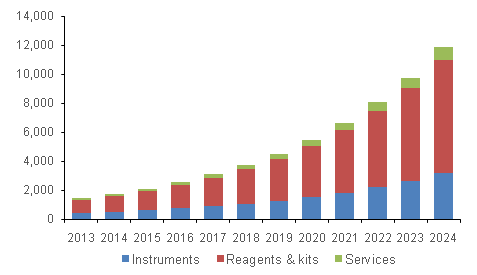 Genotyping Market Is Predicted To Reach $37.1 Billion By 2024: Grand View Research, Inc.
San Francisco, United States, 2019-Jan-03 — /EPR Network/ —The global genotyping market is expected to reach USD 37.1 billion by 2024 according to a new report by Grand View Research, Inc. The increasing demand for genotyping tests to evaluate drug efficacy and safety is one of the major drivers for the genotyping market. Genotyping tests are widely used in selecting a highly responsive, patient population subset against a specific drug candidate before initiating clinical trials. The rising need for affordable genotyping services coupled with the high demand for personalized medicines is also expected to propel the market growth. Major pharmaceutical companies are collaborating with diagnostic manufacturers for the development of novel biomarker-based therapeutics. Significant opportunities for the growth of this market are anticipated due to the above-mentioned collaborative initiatives. The increasing awareness for prenatal genetic testing pertaining to early detection of chromosomal abnormalities in the high-risk population, the introduction of technological advancements, and the increasing R&D funding are the other factors accentuating the market growth over the forecast period. The reagent and kits segment is also anticipated to witness the highest growth over the forecast period. The major factors responsible for the lucrative growth of this segment are a high amount of R&D activities undertaken by research and academic institutes for the development of novel genetic biomarkers. The diagnostic center was one of the largest segments with a market share of over39.0% in 2015. The rising demand for genotyping tests coupled with the high awareness for genetic disorders is a key driver for its large market share. Personalized medicine is expected to grow at a significant growth rate over the forecast period due to the increasing demand for the efficient and fast-acting therapeutics under the precision medicine category. North America held the largest share of thegenotyping market in 2015.The rising healthcare expenditure, established R&D infrastructure, and the increasing awareness among doctors for hereditary genetic disorders are the factors contributing to the large share. Asia Pacific is anticipated to be the fastest growing regional segment during the forecast period. The introduction of favorable government initiatives and programs, the geographical expansion of major players in this area, and the growing target population base are some of the factors expected to push forward the market growth. In April 2016, Siemens Healthcare GmbH and Thermo Fisher Scientific, Inc. declared a strategic collaboration for the development of an advanced and integrated genotyping platform. This agreement aimed to introduce enhanced flexibility and customizability to their molecular testing solutions.